It's safe to say that there are a lot of people who are surprised by the presidential election results this year. Unfortunately, the word "surprised" doesn't seem to cut it for a lot of people. There are a lot of Americans who are truly disheartened by the outcome. As expected, social media has been blowing up, and your friends are not the only ones posting inspirational quotes on social media. There have been lots of encouraging words from celebrities in response to the election. I know that right now it can be hard to feel like a social media post will make a difference, but at the very least it is nice to know that there are other people who have the same feelings you have, and that some people are also channeling these thoughts into optimism they're sharing with their friends and followers. Yesterday is done, but we still have today, tomorrow, and forthcoming days to unite and make a difference. Even if you are disheartened by the election, it is important not to lose all hope. The optimism is needed now more than ever. 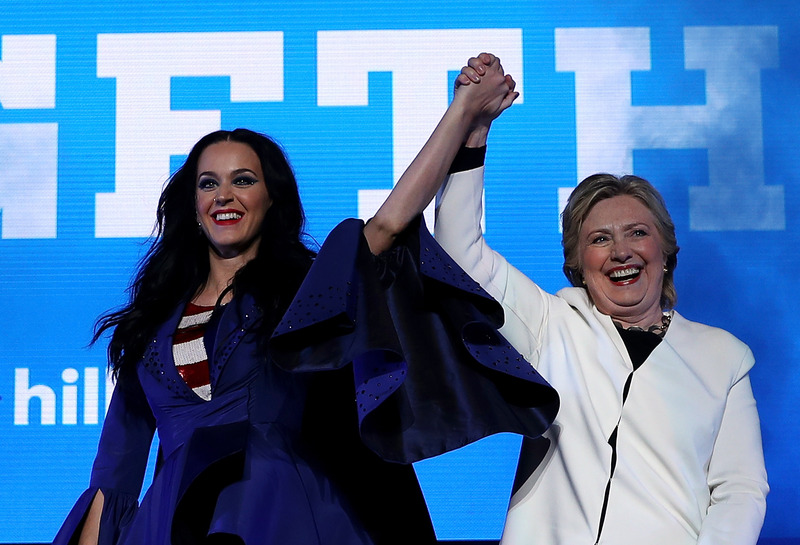 These celebrities are all about keeping a positive attitude in response to the 2016 election, and hopefully, their fans can follow suit and eventually, make the best out of the election results. The Kardashian family matriarch encouraged people to "spread love" instead of perpetuating negativity and she could not be more right. That is really what we need right now. The avid Hillary Clinton supporter tweeted a lot about the election, but this tweet encouraging people to take action in support of what they believe is right is a great message to follow. Miley Cyrus' emotional and teary-eyed video is hard to watch if you found the election results upsetting, but the note she ends on is positive: "I think now I want to be a hopeful hippie. I want to be hopeful." She added, "Please just treat people with love and treat them with compassion. Treat people with respect and I will do the same for you." The NBA star shared a lot of thoughts about the election. On Instagram, he wrote about encouraging our children to create a better future along with a video with the audio for "Alright" by Kendrick Lamar. "If we continue the faith(as hard as it may be to do so) we will BE ALRIGHT!! Parents and leaders of our children please let them know they can still change the world for the better!" he wrote. James also emphasized a need to be positive: "Don't lose a bit of faith! They're our future and we must remain stronger than ever!! Yes we all wanna lace up the boots, put on the hard hats and strike but that's not the answer. Love, genuine LOVE and FAITH will be the only thing that can get us through this." James also addressed two demographics that could really use some support these days: "Minorities and Women in all please know that this isn't the end, it's just a very challenging obstacle that we will overcome!!" Very well said. Lady Gaga explained how she wants everyone to be kind to others and declared, "Let's take care of each other now." It's a natural inclination to be angry these days, but acting with compassion and kindness is definitely the best route to take. J.Lo told her followers on Instagram, "Know who you are and what you stand for and don't let anybody or anything change that" and it's definitely something that we should all keep in mind these days. The supermodel kept it real by acknowledging her disappointment, but she also told her followers "may we not lose heart." The talk show host wants the American people to come together and realize that we are all humans beings when it comes down to it. Madonna decided to turn the Clinton loss into motivation to move on and unite toward a better future. Macklemore reminded us that we can all have a say in our own future. Part of his Instagram post says, "Remember what I have control over and what I don't. I don't have control over Donald Trump becoming president. That has been decided. But what I do have control over is where I go from here." Not only that, but he also added, "I will teach my daughter to love. All people, regardless of the color of their skin, gender, religious beliefs, sexual orientation or where their birth certificate says they're from." The actor emphasized the importance of love and optimism to his followers. Connie Britton took to Instagram to thank Clinton. She also did what she could to encourage optimism. Britton wrote, "So now more than ever we will need to hold each other up, love each other, and keep our vision and values clear." Preach. Even though J.K. Rowling isn't even American, she still had a passionate response to the results, pushing her followers to stand up for what's right. Apparently a lot of people were wishing for a real life Olivia Pope to come in and save the day. Sadly, that's not possible, but her real life alter ego Kerry Washington wants everyone to be love themselves and one another. Instead of wallowing in despair, Mark Ruffalo hopes that everyone can rally and stand up for what they believe in especially now. Kristen Bell wants Americans to remember to be kind, especially during tough times. The election results have been difficult for a lot of Americans to comprehend and deal with, hopefully we can all channel the positive energy that these celebrities are putting out there and spread some good vibes ourselves.